Dining out at a restaurant can be problematic these days. Noise levels have grown, tables are stacked closer and closer together, and glass and hardwood are all the rage for decor, leaving even less cushioning or carpet behind for sound absorption. Layer hearing loss on top of all this, and dining out can be quite a challenge. Nevertheless, a brave group of us, four of whom, including myself, have hearing issues, ventured out to dinner last Friday night. The degrees of hearing loss varied, and the technology employed by each person was different. We had 6 hearing aids, 2 cochlear implants and a very handy Roger pen between us, so we found a way to make it work and had a heck of a good time. But it took a little extra effort. When we arrived at the restaurant, we requested a table in a quiet location, explaining that most of us had hearing issues. This had not been noted in our reservation, which was a mistake. Note to self — always indicate the desire for a quiet location when making a restaurant reservation. Despite this oversight, the hostess indicated she had a quiet spot for us. We were thrilled until she sat us in the center of a very noisy room. There were no walls nearby to block the sound or soft surfaces anywhere to absorb the noise. The clanking of silverware on plates only augmented the incessant din of other people’s conversations. We took our seats and knew right away, we were going to have a problem. So we began looking around the restaurant. Was there a quieter spot available? Was there a manager who might be more receptive to our request than the hostess had been? It was a long shot, but we decided to try again to get a more conducive setting for our group. Worst case, we would stay in our noisy spot and make the most of it, like we always do. We asked for the manager and explained our situation. After a moment’s thought, he mentioned that the bar area had an open table that was available. We were skeptical — bar areas are notoriously loud — but upon further inspection by one of our group, we discovered it was much better! We moved to the bar, enjoyed our quieter surroundings, the delicious food and drink at the restaurant, and each other’s company. We still could not hear perfectly — that was never going to be the case — but the conversation flowed more easily than it would have in the first location. Most notably, we learned an important lesson in self-advocacy. Despite the disappointment of our first seating assignment, none of us got upset, or raised our voices, or caused a scene; and that was never the plan. But by politely asking a second time for an accommodation, we found someone who could help and a solution that worked well. We were all so glad that we did. Readers, do you advocate for yourself when dining out? Thank you for reading! Self advocacy can make a big difference! I try never to worry about it, besides I don’t eat out that often. Noise doesn’t bother me that much, and I always look directly at the server so we both get what the other is saying. I get excellent service, with a smile..
It’s also the music. What’s with the horribly loud music in everything from Goodwill to Good Restaurants? First thing I do walking in a place, is check out where the speakers are located so I can stay away! Everything is so loud. I have a decibel app that confirms that! Grrrr However, I usually ask to turn down the music and usually staff comply. I also try to go into establishments when I know there will be less people. I agree. Asking for what you need is often the way to a better experience. Thank you for sharing your thoughts. Hi Shari, and thanks for the post. Absolutely! I even ask them to turn down background sound, if applicable. I also bring my own personal neck loop and snell receiver and wireless mike. I ask each of my seat mates to speak into it when they are talking, including the waiter. Once I attached the mike to a ketchup bottle that Gould be rotated by each person. I have a cochlear implant and totally deaf on the other ear. Thanks Mary! I like your ketchup idea — very efficient! Mine is quite a difference. We communicate in sign language – we need sufficient light so we can see hand movements! I have asked the waiter to turn the light more bright. Some do. Some refuse and move us to the better light environment area. This is a very interesting posting. Although my situation is different in that myself am a bilateral cochlear implant recipient and my husband is hearing but has labrynthinitis which is very similar to vertigo but you don’t have to be deaf to be dizzy. He finds noisy places makes listening really difficult as it increases dizziness and when that happens listening becomes hard work in situations like that. Some restaurants are just plain loud. Then there are the ones where tables are so close together that you hear your neighbors conversation. Neither is a good dining experience. I do notice on Yelp and other sites comments on the noise level! Yes, I always check the noise levels before I go if they are available. This is a problem for everyone! Hi Shari, this is an excellent advocacy piece for PWHL to utilize when dining out. Most of the time we are the only ones in the group with HL, so our sense of empowerment is not the same as it would be with 6 hearing aids,2 cochlear implant s and a roger pen walked into a bar.. However, the message is the same. We want to be seated in a quiet area conductive to conversation, we want the server to look at us, speaks slowly, and clearly so we can understand options. And finally we want to be able to engage in conversation with our dining companions. As someone who as being doing this for a very long time, I can not tell you how much easier this is to do—(to make the requests to be moved).. accompanied by other people who struggle to hear. Being surrounded with a group who understand what it’s like to miss dialogue, to have to see the speaker, to ask for repeats, who struggle to hear over the music and noise of the heating/ cooling system than it is to dine with healthy hearing companions. I have a friend who has experienced a sudden drop in hearing with whom I’ve been dining for over 30 years…. we also have discovered others in our group who can not understand at the noisy restaurants… this is what he does now when we all dine together. He says: my friend Cheri, and he indicates me.. is hard of hearing, when you give the specials, could you speak a bit more slowly and look directly at her? This is brilliant. Because not only does he bring hearing loss out into the open, he educates the server on what is needed to communicate effectively. 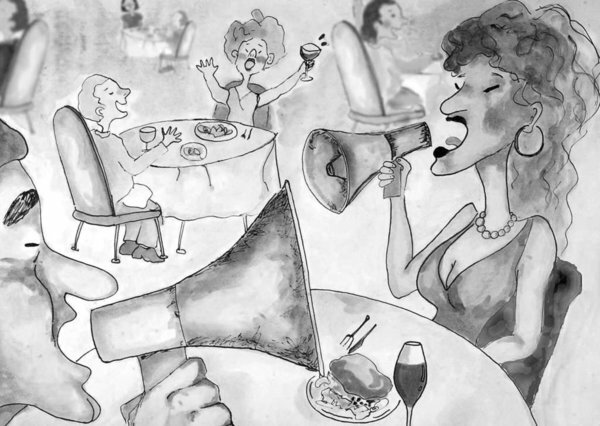 When the server starts their spiel, they make an emphasis to speak slower and louder, to enunciate clearly and as a consequence, those who are struggling to hear but do not wear hearing aids are now able to understand the server. My friend, as my dining companion, has learned what to say because he has heard me make these requests repeatedly for many years. I’m thrilled because no longer am I the one who has to make the request! Moving forward, I would love to see a blog about incorporating assistive technology; a roger pen (other options welcome) into the restaurant and social conversation. I can ask a single dining companion to use Roger, but it doesn’t work well (for me) in noisy restaurants with multiple talkers. I can’t place roger in the center of the table ..Roger is supposed to be able to incorporate multiple speakers ( with multiple pens or remote mics) and users ( think classroom settings) I do not have other people with whom I can experiment and use Roger in this way. I do know lots of people who have Roger, but they don’t live near me! Thanks for sharing your experiences and suggestions. There is definitely strength in numbers. I try to ask for a quiet table now even when I am the only one with hearing loss. It can’t hurt to try. Hi! I have a Roger Pen, and when my girlfriend and I dine out, she’ll wear it around her neck. In groups (even 3-4 people), and even on “conference/table mode, it usually also picks up the surrounding cacophony too. Interesting. I wonder if its settings can be adjusted somehow to improve performance. My friend swears by hers. Thanks for sharing your experience. Don’t forget the ambient lighting! I depend on lip-reading a lot — and when they dim the lights in a restaurant at the “romantic hour” of around 7 PM, I not only can’t easily see what I eat, I stop hearing whose face I can’t see. That is a shame. Perhaps you could contact your audiologist again or Phonak directly. I do not have one myself, but my friends that do love them! Hello, I’m from Indonesia and the awareness of hearing loss hasn’t been quite sufficient here, although there thankfully some hearing aid centers in major cities. 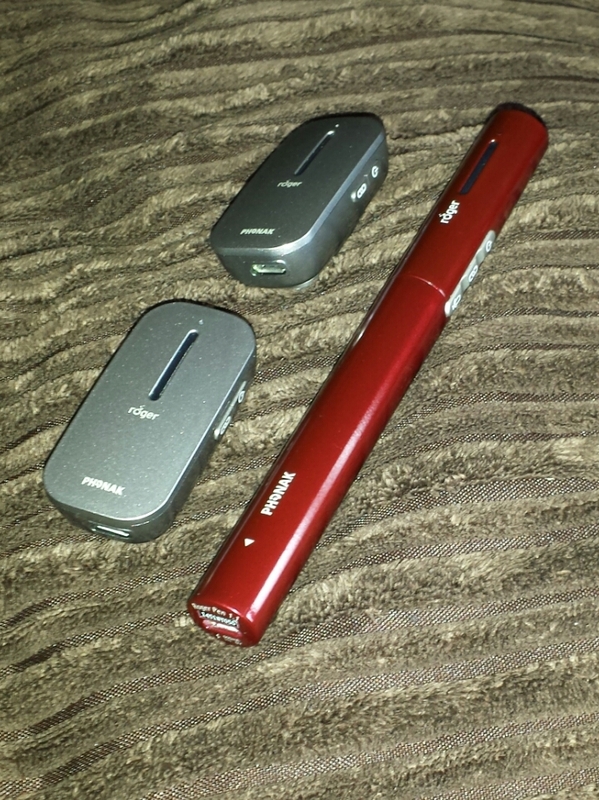 Reading your blog is one of my enlightment for me to get through my hearing loss journey. So glad you found the blog! Have you tried using noise canceling headphones? Sometimes that helps me block out the background noise to better hear voices. Good luck to you!